PrestoSoft Blog: ExamDiff Pro 6.0 Beta! We are pleased to announce that we've just released a beta of ExamDiff Pro 6.0! The biggest new feature in version 6.0 is our most-requested feature to date: three-way diff and merge. 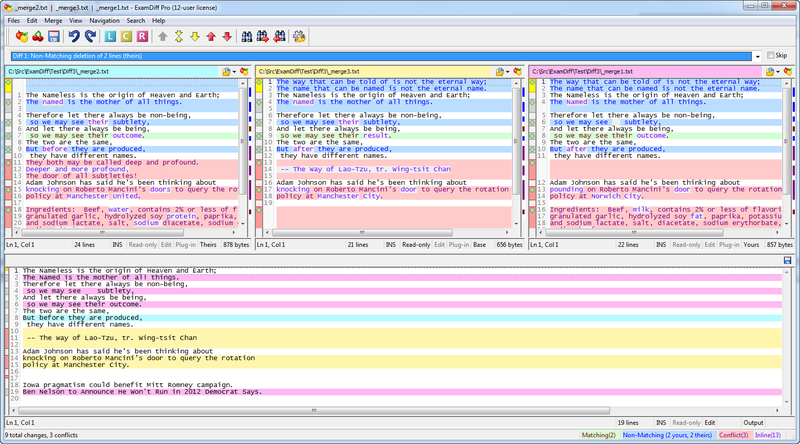 In three-way merge, three files are compared - a base file and two revision files ("yours" and "theirs") that are both modifications of the base - and the goal is to reconcile the changes made in the revision files into an output file. ExamDiff Pro allows for both intelligent automatic merge resolution and manual merge resolution with an easy-to-use interface, as shown above. You can find more details about the 6.0 beta, and a download link, here.